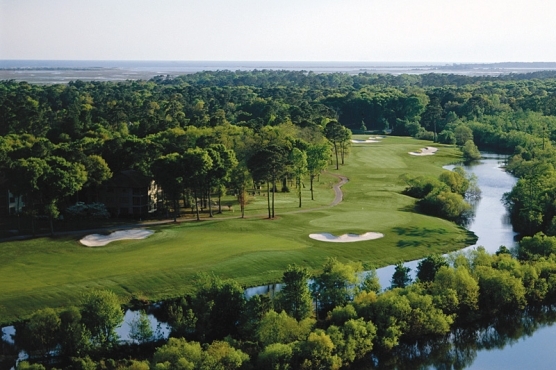 March is almost here and many golfers will be headed to Myrtle Beach for their annual spring golf trip. The wind can blow year round at the beach but March can be particularly windy. Having grown up in the Panhandle of Texas, I learned to play in the wind from the beginning. If you have not been to the Panhandle, it can be quite breezy there. Playing in the wind in Myrtle Beach is somewhat different than in Texas. Hopefully these tips will assist you when you are battling in windy conditions. JUDGING THE WIND – Many golfers fail to realize the exact direction and speed of the wind before they choose their shot. While it can be difficult to be exact, there are some indicators that you can use. Pay attention to the tops of the trees (this can be difficult in Texas because of lack of trees) but in Myrtle Beach the tree tops should indicate some direction of the wind. Be careful because that may be deceiving. The tree tops might be moving in one direction from where you are playing from and a totally different direction by your target. Throw some grass up by your ball to assist in this. If you are by a water hazard, simply look which way the currents are moving. Another very good indicator is to try to face directly into the wind (the breeze on your face will give you a good idea of which direction the wind is blowing). CHOOSING YOUR CLUB – This can be a very difficult thing to do. I feel that quite simply most people rarely choose enough club on their approach shots (not just on windy days). The object is to control your trajectory. Regardless if you’re playing downwind, into it or cross wind, it is extremely important to control the trajectory. If you are playing downwind the ball will definitely release and run more on the ground, just as it will check up or “bite” going into the wind. Some think that you should only use a less lofted club when going into the wind but that is not always the fact. If you can learn to control your trajectory and use less loft going down wind, you can have more control rather than just launching a high shot where the wind takes over. Off of the tee you might find that it is a smarter play to use a three-wood or hybrid when playing downwind. On windy days you must keep the ball in play and on downwind dogleg holes this can keep you from driving through the fairway. WIDEN YOUR STANCE – Widening your stance will lower your center of gravity which will automatically make your swing shorter (for control) because turning your body is more difficult when your feet are set wider apart. It will also give you more stability and assist in maintaining your balance. GRIP DOWN ON YOUR CLUB – Gripping down (or choking down, I don’t like to use the word choke in golf) and taking more club will simply give you more control and assure a solid strike. SWING EASY – Swinging hard is another major mistake when playing under windy conditions. It is hard enough to maintain your balance and over swinging will only make matters worse. Again, taking more club, gripping down and swinging easy will help in assuring solid contact with the ball. DON’T FIGHT IT – Use the wind to your benefit. If it is blowing left to right simply aim left and let the wind blow your ball to your target. Conversely, if it is blowing right to left, let the wind help you. If you are an extremely accomplished player and can curve the ball at will, you may want to draw the ball into a fade wind and cut the ball into a hook wind (most amateurs should not try this). PLAY THE BALL BACK IN YOUR STANCE – Playing the ball back in your stance and hitting down will help in keeping the ball low and controlling the trajectory. Now this is another factor that many overlook (especially with your shorter irons). In Texas when playing a ball back and hitting down, the turf is usually firm. In Myrtle Beach you may encounter softer or wetter conditions. If this is so you don’t want to hit down too steeply. This will result in the ball riding up the clubface and completely destroying a solid strike. YOUR FINISH – Quite simply, if you want to hit low, finish low. If you want to hit it high, finish high. PUTTING – Wind can definitely affect your putting, especially on fast greens. If you are putting downhill, down grain and downwind, be very careful of your speed. It will be fast. The reverse is true going uphill, into the grain and against the wind. On breaking putts you need to consider playing more break if the apex point of your line lets the ball continue downwind to the hole. PLAY WITHIN YOURSELF – The wind is blowing and it is the same for everyone that day. Don’t let the wind influence your choices and try to play heroic shots. Consider laying up when you might normally going for it. Doing this will help you enjoy yourself and lower your score instead of fighting the elements all day. ENJOY THE DAY – You are in Myrtle Beach ( or where ever you may be playing), you are outside on a beautiful golf course and you are playing the greatest game ever. Don’t let a little breeze spoil your day. Embrace it and enjoy yourself.